The 150cc bike segment has been very uneventful historically. But with Yamaha’s FZ 2.0 and Suzuki’s Gixxer this segment has livened up like never before. We compare both these machines to figure out which one outsmarts the other one. Yamaha rolled out the latest variant of its highly successful FZ not so long ago, called the FZ 2.0, and Suzuki came up with its Gixxer more recently. 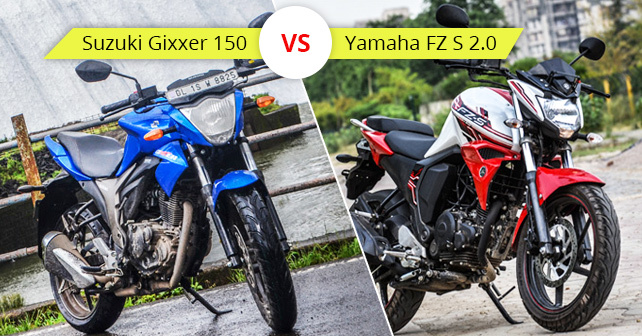 The Gixxer and the FZ 2.0, both, target a younger audience who want to not only look good, but also ride fast. So, are these motorcycles worth the hype, and the money you invest in them? Well, we decided to test them together in an attempt to find an answer for you. The 2014 FZ, meanwhile, is four cc and one bhp less than its previous avatar – but flaunts something known as Blue Core technology, which is supposed to find a perfect balance between fuel-efficiency and performance. The engine ‘sounds’ very refined and twice, at a traffic signal, I had to check if the engine was still alive and well – it’s that silent. Acceleration wise, twist the throttle and the bike effortlessly hits the rev limiter in every gear – thanks to the highly responsive fuel injection system, which is one of the main changes to the FZ. While the claimed speed of the FZ is 116km/h, it struggles once you cross 100km/h. The power, in fact, is just enough to satisfy most customers. The power delivery is linear, but the handling is brilliant. Speed is all very well, but bikes like these will be used primarily in the city – and so it’s important for them to be comfortable first and foremost. In this respect, the Yamaha is very comfortable thanks to a redesigned seat. Riding posture is more aggressive than the Gixxer’s, but it lets you remain in control in most riding conditions – including when negotiating city traffic. The seat is wider than the Gixxer’s and hence provides much more comfort. Yamaha has also fitted an ‘Eco’ indicator in this machine, which goes green when you’re riding in a manner that’s fuel efficient. This also marks the beginning of an era where Yamaha has decided to turn towards fuel-efficiency in order to increase their sales. That being said, this is still a bike that gives you the confidence to take on corners – as the MRF tyres provide ample grip.